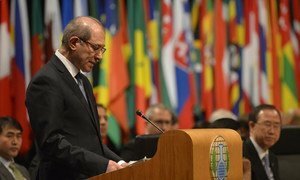 The deadline set for the removal of the most critical chemical weapons material from Syria for destruction will not be met owing to technical difficulties, the Joint Mission of the Organisation for the Prohibition of Chemical Weapons (OPCW) and the United Nations said on Saturday. At the end of October, the Syrian Government destroyed critical chemical weapons production equipment, rendering it inoperable. By doing so, Damascus met the deadline set by the OPCW Executive Council to complete the destruction of such equipment by 1 November. According to the plan approved by the OPCW, Syria's chemical weapons will be transported outside its territory to ensure their destruction in the “safest and soonest manner,” and no later than 30 June 2014. The 31 December date for the removal of the most critical chemical weapons material from Syria for destruction was the first “intermediate milestone” set by the OPCW. “A number of external factors have impacted upon timelines, not least the continuing volatility in overall security conditions, which have constrained planned movements,” said the Joint Mission. The removal of the chemical agents out of the country involves transporting them to Latakia, where they will be shipped on commercial vessels provided by some Member States. They will then be loaded onto a United States ship and destroyed at sea using hydrolysis. The Joint Mission noted that Syria has indicated its specific requirements, which it deems critical to the package and transport of chemical weapons material. A wide-scale procurement effort by individual Member States has been facilitated by the Joint Mission to source, collect and deliver various packaging and transport materials requested by Syria. Logistical challenges coupled with inclement weather have contributed to this delay. The Joint Mission added that the OPCW Executive Council will meet on 8 January, and OPCW-UN Special Coordinator Sigrid Kaag will report to the UN Security Council on the same day. Secretary-General Ban Ki-moon, in a statement issued by his spokesperson, stressed that the international effort to eliminate Syria's chemical weapons continues to make effective progress, as demonstrated by the “steady achievements” in meeting all previous milestones the past three months. “Despite this delay, the Joint Mission continues to work closely and intensively with the Government of the Syrian Arab Republic and the assisting States Parties to begin safe and secure removal and transportation operations as soon as possible.